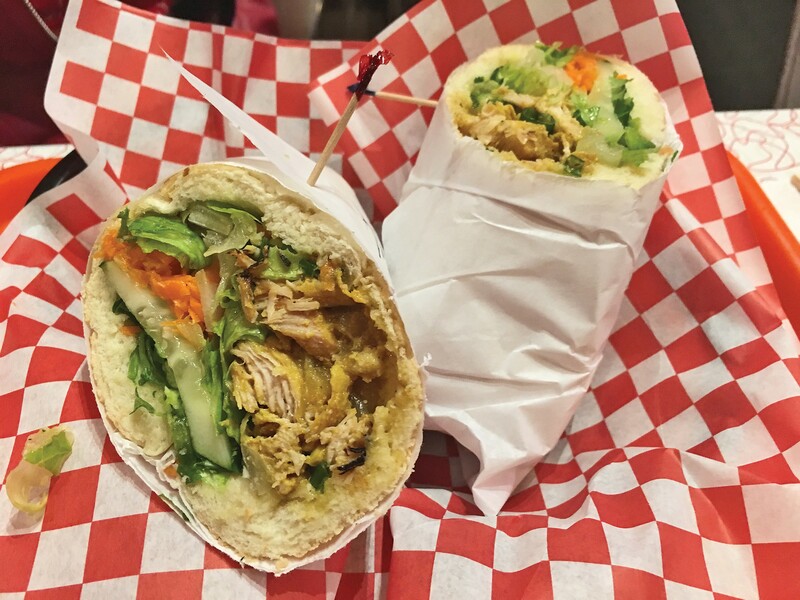 Tracking Vietnamese flavors from Midvale to Clearfield. A positive result of the emigration to this country by Vietnamese families, both during and following the Vietnam War, is that their cuisine was exported along with parts of their culture, and it's now become part of ours. There are dozens of eateries along the Wasatch Front that feature popular Vietnamese foods such as pho and banh mi, like the two I'm focusing on here: one down south in Midvale, the other up north in Clearfield. Pho 33 probably wouldn't have shown up on my culinary radar otherwise, but their discount dinner coupons offered through the City Weekly Store caught my attention. The restaurant doesn't have much curb appeal. In fact, walking into a nondescript side-door off the parking lot, it looks like an underground drinking club, or a meeting space for secret societies. Frankly, it's not a whole lot better inside, décor-wise. But, it's a large space where you won't be cramped, and the staff is very friendly and welcoming. We settled into a booth and ordered beverages (no booze here) and a couple of appetizers from the extensive menu. I was immediately struck by how low the prices were. For example, an order of fresh shrimp spring rolls is $4.50. Wrapped in rice paper, cut into six manageable pieces and served cold, two full-sized spring rolls are stuffed with tender cooked shrimp (tofu is also an option), shredded lettuce, avocado wedges, mint and thin vermicelli noodles. The thick, rich peanut dipping sauce alongside was wonderful. Another enjoyable appetizer is dau hu me ($4.25)—firm tofu that is battered, deep-fried and coated with sesame seeds. I liked the tofu quite a lot, but couldn't detect any sesame seeds, besides those floating in the tasty garlic-soy sauce it's served with. Folks like me, who don't mind a meaty salad, will enjoy the goi bo, a salad of cubed beef filet with cucumber, celery, onion and tomato, all tossed in a zippy chile-lime dressing ($9.95). Service could not have been friendlier or more informative, which makes Pho 33 a good choice for anyone new to Vietnamese cuisine, or who might be intimidated by the exotic menu. One stir-fry dish we enjoyed, which was recommended by our server, is lemongrass chicken ($7.50) called com ga xa. It's a simple, but flavorful plate of tender, lemongrass-infused, boneless pieces of chicken fried with onions and hot dried chili peppers, served with rice and a side salad. Pho 33 strives to satisfy a range of palates with a pan-Asian menu where you'll find, in addition to Vietnamese dishes, ones like pad Thai, sweet-and-sour pork, Malaysian rice noodles, walnut shrimp and kung pao chicken. Still, lots of regular customers come for the pho, Vietnam's contribution to the world's great soups. At Pho 33, it ranges from $3.95 for the kids' size, to $6.50-$12.50 for adult servings. Options include tripe, meatballs, rare beef, brisket, tendon, chicken, tofu and veggie. I opted for the priciest version: pho with kobe beef ($12.50). The well-balanced beef broth was subtle and quite clear, not cloudy, with flavors and aromas of cinnamon, star anise, ginger, black cardamom and onion. A hefty portion of perfectly cooked rice noodles was submerged in the broth, with thinly sliced, lean kobe beef and scallions floating on top. Alongside were the traditional accoutrements of Thai basil, bean sprouts, cilantro, jalapeño slices and lime to use as desired. While heading up to Ogden recently, I spotted a little Vietnamese eatery just off the interstate in Clearfield. Pho Banh is a Vietnamese sandwich and noodle shop located in the Legend Hills development just north of Layton, which is also home to Lucky Slice Pizza, Chen's Asian Cuisine, Tepanyaki Japanese Steakhouse and Sushi Ya. I wasn't sure what to expect, but left Pho Banh saying, "I'll be back!" Low prices and super-friendly service will have you saying the same. It's a tiny place where you order at the counter, and much of the food is served on Styrofoam. We grabbed an order of shrimp spring rolls ($2.75) from the refrigerated self-serve shelves (where you'll also find avocado rolls, cold drinks and such) and placed an order for pho and banh mi. I felt a little guilty—like I'd just committed a bank heist—when the bill, including drinks, came to less than $20 for two hungry people. The shrimp rolls—steamed shrimp, shredded carrots, lettuce and vermicelli in rice paper—were satisfying, especially for a mere $2.75. My wife enjoyed an excellent banh mi sandwich—there are 10 different ones to choose from—of cari ga, or curried chicken. The sandwiches are served on slightly crisp, lightly toasted hoagie-style rolls with butter, cucumber, jalapeño, cilantro, carrot, pickles and lettuce, plus whatever main ingredients you'd like. Options include barbecue lemongrass pork, teriyaki chicken, garlic beef, lemongrass tofu, grilled pork meatballs and traditional pork. Beyond the alluring flavors and textures—spicy and sweet, crunchy and soft—the cari ga was also a bargain; it was much more than we could eat in a single sitting. Luckily, Pho Banh is well-equipped for food on the fly. It's the perfect place to grab a to-go meal the next time you find yourself hankering for Vietnamese flavors in Clearfield.